From the subtitle of this book we gather that the author, Ms. Lauren Sandler, (who writes often on cultural politics and women’s issues), has a position to defend, a perceived cultural and parenting bias to correct. Many readers might not give much consideration to whether only children being better or worse off than children who are siblings. For many years I have taught only children, and in that context they seem no different to me from sibling children. What then is this book about? 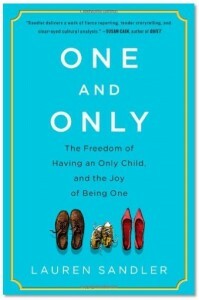 The book raises provocative questions, and challenges assumptions: on the nature of families, parenting, and how these interact with socioeconomic, cultural, political (such as pro-life and right of choice) issues. Parents who read the book will gain (perhaps) a different perspective on the reality of their choices. Ms. Sandler claims in the Introduction that although her mother made the choice of raising her as an only child (a choice the author in her turn chooses as well) this book is not a memoir. It is a memoir as we are regaled with stories of how, when, and why both women made this choice and its consequences for them and their families. “To have a happy kid, I figure I need to be a happy mother, and to be a happy mother, I need to make choices within the limits of reality . . . work, finances, pleasure . . .” On the last page of the book the author states, “There’s a reason this book is not a memoir . . .” and she shares that being an only child is not the stereotype she embodies, not the narrative she chooses for herself. From the context and content of the book then, we gather this narrative is primarily about defending this “choice.” A choice, let’s be honest, mainly applicable to financially secure, usually well-educated couples—north American and north European—those who have access to medical health and other resources to build this family structure. Ms. Sandler’s research is wide ranging, and she writes in a direct and chatty tone, her “facts” mainly anecdotal. She touches on the history of large settler families in rural America around Independence and beyond, her own experiences at school and in young adulthood, pros and cons of the parental/only child symbiotic relationship, two-career parenting and the only child. Her young daughter, Dahlia, plays a large role in this non-memoir narrative, as the touchstone “only child,” along with Ms. Sandler’s discussion on findings from venerable institutions such as Pew surveys. One chapter worth noting is Ms. Sandler’s trip to Beijing, China, particularly when she briefly examines the One Child Family policy that Deng Xiaoping instituted for the country in 1979. Is this a resounding closing statement on the case for only children? Certainly, China has made extraordinary strides in the past 40 years; however, the Only Child policy has spawned major socioeconomic issues for the massive, currently aging population with not enough trained caregivers and medical resources. The vast majority of the Chinese population remains impoverished and agrarian. Janet Levine is a journalist and author of four books including Know Your Parenting Personality: How to Use the Enneagram to Become the Best Parent You Can Be. I really wish to tell you which I am novice to wordpress blogging and genuinely adored your webpage. Quite possibly I am prone to save your webpage post . You indeed have impressive article topic. Admire it for giving out with us your internet post.